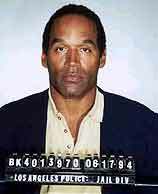 History hasn’t meted out justice very even-handedly across the decades in show trials and what worked reasonably well at Nurnberg after World War II has been far less successful with the likes of O.J. Simpson, Yugoslavia’s Milosevic, Iraq’s Saddam and lately, America’s sentencing trial of terrorist Zacarias Moussaoui. Big shows, every one. Mixed successes, but mostly duds. 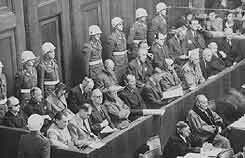 Taking them one by one, the Nazi trials at Nurnberg worked (for the most part) because there were a wide range of defendants and some were acquitted, some sentenced to prison for varying terms and some to death. Nurnberg was staged by the victors. That’s a given. War covers a multitude of crimes and who gets charged by whom depends on which side is left standing at the end of the battles. Hitler didn’t get his chance at Nurnberg and no doubt that helped. The docks were full of petty criminals, Bugs Moran Chicago-thug types, but no Al Capone. Fast-forward to O.J., the first of the celebrity murder trials, and it’s interesting to note the difference in national attention a wide grin can make. O.J. was everybody’s hero, loved as the guy who blitzed the lines of car-rental commercials and winked at the ladies. Contrast the coverage of his trial with the recent Robert Blake trial for very nearly identical crimes. Both celebs, both not guilty, both probably did it. No one cared much about the old and unhandsome Blake getting off, but Simpson was a jaw-dropper. But of course we who say they did it, never sat through days and weeks of testimony. We made up our minds the easy way. Who else could have done it? A slam-dunk for unenlightened gut feeling, something else for the jury. Or was it? How willing are juries to send off celebrities to the slammer? Michael Jackson? Not hardly. Above all, the country talks about these trials endlessly, the news media feeds off that and we’re left breathless by the end. At least there was an end. Sometimes, when governments get involved, there is no end. 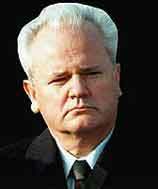 Yugoslavian president Slobodan Milosevic had been on trial in the Hague for four years. Four years! What on earth is that all about? Milosevic died of a heart attack on Saturday, and thus the United Nations war crimes tribunal ended its case against him without a verdict. Four years, a country torn to shreds, tens of thousands murdered and no verdict. The presiding judge, Patrick Robinson of Jamaica, rapped his gavel and said, "His death terminates these proceedings." I guess. So no one is satisfied, because the United Nations, like all other quasi-governmental organizations is a bureaucracy inside a bureaucracy buried within a bureaucracy. Prosecution by bureaucracy is like salad left in the sun, wilted and unpalatable by the time dinner is served. No pace, no grace, no sense of either justice or outrage by the time four years unspools. Who even cared any more? What is left of Yugoslavia has long gotten over this small-time version of a war criminal. Milosevic took over the stage he was given. Maneuvering away from the personal responsibility with which he was charged, he put the world on trial in his place. It was allowed as this farce went on to take a life of its own beyond the court calendar. Now he’s dead, possibly because of improper confinement. No one can ever really know. Like O.J., he’s off the hook on a technicality, only his ticket was a heart attack. 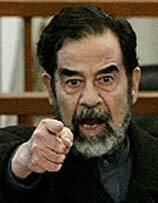 In Iraq it’s early days, but Saddam has flummoxed a half dozen judges and taken the courtroom as his personal international platform. His latest public rant is to urge insurgents to keep the faith, keep those bombs and rockets coming. What was expected to be a straightforward task of listing and proving his crimes, he has has turned into high drama, challenging the legality of the court. In a fractured country, with no political cohesion, he may well have a point. It’s not beyond imagination that a country torn by civil war may end up putting him back in control. Wouldn’t that be a fitting conclusion to this seemingly endless tragedy? Sunni Muslims storming the gates of the prison, America gone home and a madman back in charge. Preposterous from here, but there are Iraqis who miss the peace and order, just as Hitler ran the trains on time. The last of the current show trials concerns the only guy we have left alive to take the fall for 9-11. Zacarias Moussaoui has already plead guilty to not telling the FBI what he knew on plans to fly jetliners into buildings. Whether the FBI would have done anything or not is another question, but he’s guilty by his own admission. Nothing to do but sentence him to either death or life in the pokey without parole. Simple, huh? Should be, but this is a show trial by an already badly battered Justice Department. They've been preparing the case for death for four years. That should have been a tipoff. Bureaucracy strikes again in the name of the law, making the simple complicated and, sure enough, they screwed it up. So many lawyers stumbling around that no one noticed the pushy blonde babe violating judicial orders, illegally prepping witnesses and lying to the defense about witness availability. They didn’t notice. A major pillar of our storied Department of Homeland Security spent four years getting ready and they didn’t notice. All in all, the show trial business doesn’t return all that much on investment. Maybe Romania had it right when they shot their communist president on the night after their revolution. Case closed. At least Romanians got that closure thing that everyone keeps talking about as being a necessary indredient in modern life. We didn’t used to have closure. Things like world wars and national disasters, murders and injustices just got over with and life went on.